Ryan taunts Riley with a “Maarrrrrty … Maarrrrrty” chant as she tends goal outside the NHL Draft. The NHL Draft was held yesterday at the Prudential Center in Newark. I was working at the event, but as Devils season-ticket holders, we were able to get tickets so the rest of the family could attend. Why go to the NHL Draft, you might be wondering? And you would have a legitimate question. Sports drafts are not the most exciting of events. But it was a weekend, and it was free, and it was about hockey. Good enough for us. 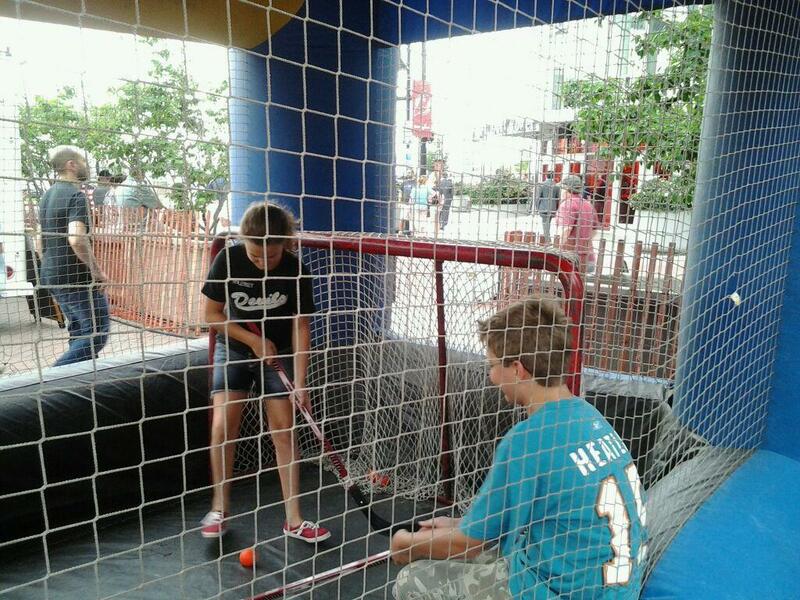 Besides, there were some outdoor hockey-themed activities planned, plus games and rides. As a person who works in the hockey world, I love the draft for three reasons. One, I love seeing innocent 18-year-olds realize their dreams. It’s like getting an invitation to a private party at the bet day of someone’s life. Seeing the young draftees so exited is one thing, but I also love to watch their parents. Few sports parents sacrifice as much as those in hockey, with the expensive equipment and dues, ridiculously early games and practices, and long trips through often miserable weather. To see parents get to realize all the sacrifice was worth it as their child achieves their dream is very powerful. Second, the draft comes at the end of hockey calendar, and it very much has a “last day of school” vibe. When the last pick is made, hockey people say goodbye to each other for a few months and head off to vacation. Training camps open in about 10 weeks. But the other reason I love the draft is it is like a Star Trek convention for hockey nerds. Hockey is a tribal sport, with almost a cult following. There are very few casual hockey fans. You either buy jerseys, buy tickets, paint your face, and live and die with your team, or you make jokes about hockey’s TV ratings. There is very little in between. Well, the draft is where the former group comes to gather. People who come to the draft don’t like hockey. They love live hockey. It’s the same thing with people who work at the draft. It’s like a who’s who of hockey royalty. Walk the draft floor, as I was lucky enough to be able to do, and there are Hall-of-Famers everywhere you turn. Some are coaches, scouts, general managers, assistant GMs. Some are player agents or family advisers. But everybody who is anybody in the game is pretty much there. And they all spend the hours before and after catching up with each other on old times. It’s not uncommon to find a huddle of ex-players, who combined to score a couple thousand goals in their careers, talking about golf or fishing. The draft is also about human emotion. Yesterday, the host Devils were the story, book-ending the draft with its best moments. They dramatically traded their first pick for a goalie who will ultimately replace their 41-year-old legend (and Riley’s favorite player), Martin Brodeur. The full house roared its approval even as the changing-of-the-guard moment became clear. Then, some six hours later, long after the majority of the crowd had gone home, the Devils traded for one of the final selections. The few thousand people left began to murmur in anticipation of what was about to happen. The Devils allowed Brodeur, sitting at the team’s table, to announce the choice: goaltender Anthony Brodeur, his son. In a sometimes cut-throat business, it was incredibly human moment. Into all this wandered Ryan. We had our standard worries. Would he be bored? What if he had to wait? Ryan loves hockey games, but the draft is most definitely not a game. I wasn’t going to be much help down on the draft floor while Veronica and the kids were up in the seats. The first text from Veronica wasn’t good. There was street hockey outside, but the teams we pre-chosen and Ryan couldn’t play. There was nothing for him to do and still two hours until the first pick. But things quickly improved. They found another street hockey area and Ryan was happy. Riley hit up the boardwalk games. Ryan ran up to other Sharks fans and made friends with the other boys playing hockey. 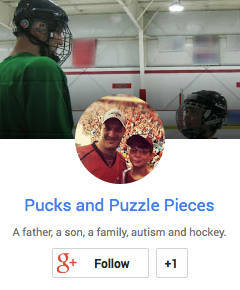 As Veronica told me, she was bored and hot and miserable, and then watched her son with autism feeling at ease among strangers in a loud, chaotic environment — an all-around win. They easily passed the time until the draft began. The draft opens with a roll call of the 30 teams, which is fun as the home fans boo their rivals and any teams with which they have a beef. The Devils fans did not disappoint, booing the Rangers, the Flyers and the Penguins, but also the Kings (for last year’s Cup final) and the Wild (for signing away Zach Parise). Ryan loved it, and got into the act, cheering for the Sharks and booing their rivals. He sat in his black Sharks jersey, standing out in a sea of red Devils sweaters. They didn’t last long, leaving shortly after the Devils made their big trade about an hour into the Draft. But the outing was a success. It was a hockey convention, and Ryan fit right in. He was among his people. Love Marty’s proud papa smile at the announcement – and love that it was Bruins fans who shook Anthony’s hand on the way over! That was a great moment. There had been some speculation it might take place, but when the Devils were out of picks and final round almost over, it was quite a surprise they made the trade and allowed Marty to announce. Great stuff.